Elvis Enthusiasts Unite: Kiss me like you love me. Kiss me like you love me. 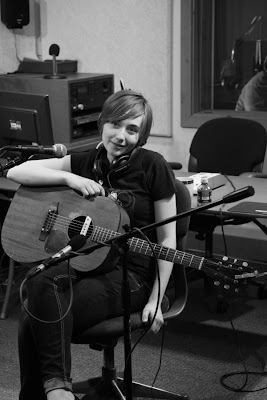 Once upon a time, about a week ago now exactly, a new favorite musician of mine by the name of Jessica Lea Mayfield came to play at that radio station I have a show on. As soon as I heard she was coming, about two months back or more, I seized the opportunity to invite her around and, well, she agreed. Lucky us. She was brilliant and charming and made me feel like an old, old man when she told me she was just 19 years young. I guess that sort of thing isn't going to go away, is it? I digress. She played a few songs and sipped on her tea and, just like that, was off for a sound check for her show later at Kilby. My favorite story was when she said that the guitar she was playing on—older than she was as it'd been around since 1963—was her father's version of an engagement ring. There was no ring, per se ... he'd simply given her mom a guitar, as they were (are?) both musicians. You want romantic? That's romantic. Here's one of the songs I taped while she was there. Enjoy. I very much enjoyed that. Simple beauty. One guitar, one voice. I'm glad to know I'm not alone. I have always said that I don't want a ring...a guitar says, "let's create". Nice. You always discover me the most fantastic artists. Thanks for posting :) I've been listening to her nonstop for the past 3 days.